Outrage doesn’t often transform into action and policy change. Just ask the people of India who have been inhaling increasingly toxic air for decades. 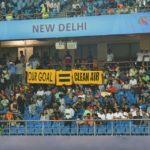 Now, Help Delhi Breathe is building a movement that puts the people of Delhi’s frustrated communities out front and leading the way towards clean air. Winter in Delhi means the arrival of what some call the world’s worst air pollution. The winter of 2015 was no exception. But that winter also saw the arrival of an American president, global pressure, citizen outrage and an opportunity to act. A new coalition, Help Delhi Breathe, organised a platform – on Facebook and through on-the-ground networks – for sharing new messages to empower people and mobilise community-led solutions to the complex, decades-old crisis. Three years in, progress is being made. Here’s how it’s happened and what Help Delhi Breathe has learned along the way. The people of Delhi are no strangers to air pollution. Every winter they live amidst a haze that burns eyes, clogs lungs and can stop daily activities like going to school, exercising, and simply going outside. By early-2015 people across Delhi were demanding action from their leaders and each other. 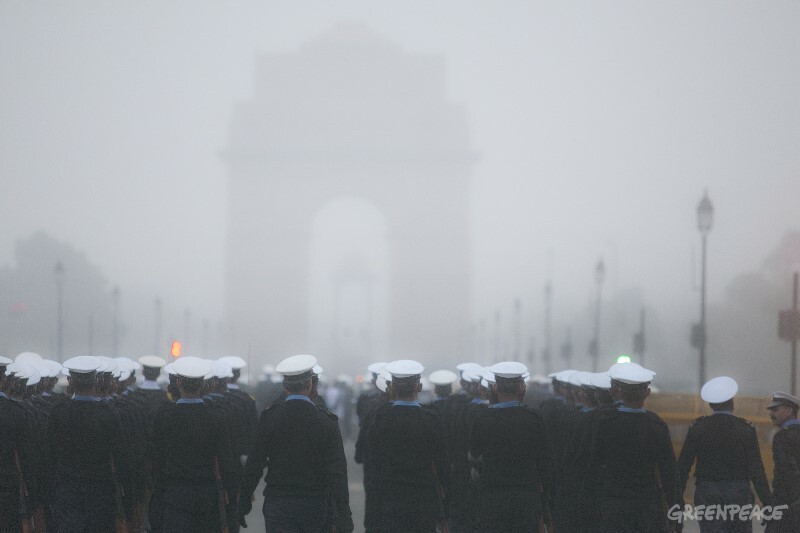 Smog at Republic Day rehearsals at India gate, Delhi, in January, 2015. 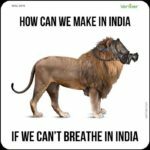 © Sudhanshu Malhotra, Greenpeace. 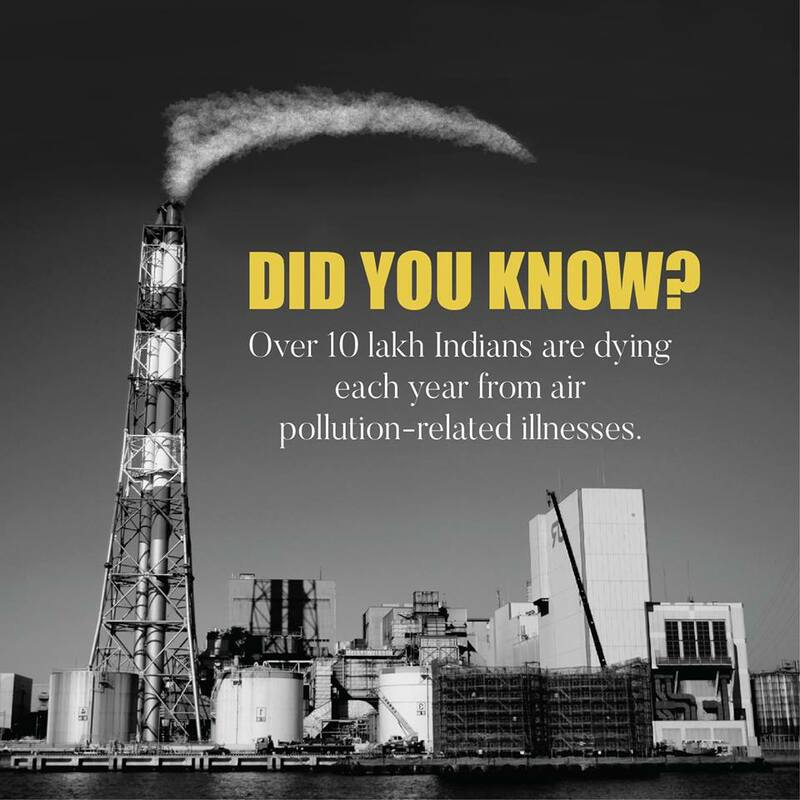 In 2015, Help Delhi Breathe formed to address air pollution in Delhi. 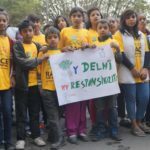 Help Delhi Breathe began creating something new: a platform for learning and people-powered mobilisation. Delhi’s population, especially the educated and increasingly influential middle and upper class, are tech savvy and well-connected by the internet, smartphones and social media. Systems for rapid message distribution and online organising are in place. Help Delhi Breathe started with refined communications, dedicated organising and some good power mapping. 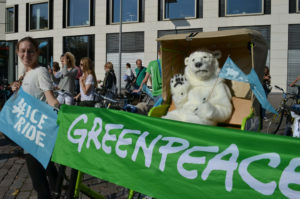 Local groups and communities – some longtime activists on air pollution and others new to the issue – were gathered together and listened to by organisers. Creative, often cheeky, messages found their way into photos and videos people shared. Talking about (and taking action to change) Delhi’s air pollution became an empowering conversation. Witty and shareable videos got people talking about air pollution but long-term change means a broad coalition campaign that engages new audiences, gives people power to contribute their own actions and ideas, and moves people from widespread frustration to attainable solutions. Sometimes called the world’s most polluted city, Delhi’s air pollution problems are decades in the making. Rice farmers outside the city burn fields, causing plumes of smoke to cover northern India. The metropolitan area has around 30 million residents. Population growth and rising incomes mean more cars with poor pollution controls. Fires in the city are used to burn trash, cook food and keep warm. The government previously took steps to address air pollution. Buses, auto rickshaws and taxis were converted to CNG (Compressed Natural Gas) in 2001. The policy was hailed as a transformative move for the capital. The government then stepped aside and ignored air pollution for a decade. By the early 2010s, winter in Delhi meant a toxic, highly visible smog. New Delhi’s position as both a national capital and a state/province of its own within India complicates policy making. Central and state governments fight over who should take action. That’s especially true when led, as the governments are now, by different parties. Air quality during the winter of 2015-16 was as bad or worse than usual. Air pollution levels were alarming: PM 2.5 measured nearly 600 (the Indian safety limit is 60; the World Health Organisation limit is 30). But that winter saw another, more welcome, visitor: U.S. President Barack Obama. Indians and the world may not recall much about what Obama said in Delhi. They do remember hearing about the air he was breathing. 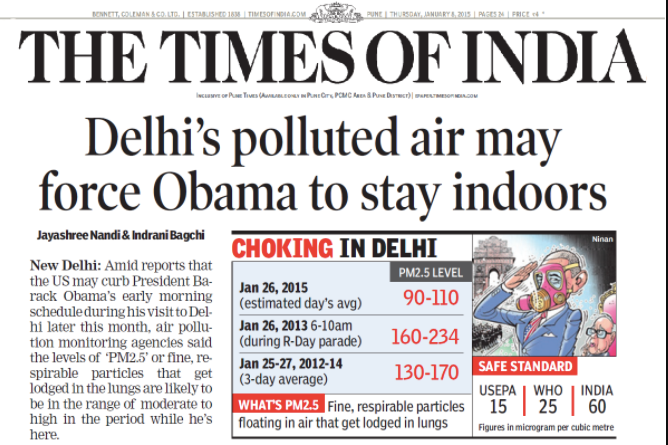 In Delhi and across India, news coverage of President Obama’s visit highlighted the city’s toxic air. This story came alongside increasing coverage of the city’s deteriorating air quality and government’s inability to find solutions. People were frustrated. Inside an office at Haus Khaz in New Delhi, a small team gathered including people from Purpose and other groups like Greenpeace India, Center for Science and the Environment (CSE) and The Energy and Resources Institute (TERI). How do we turn people’s pent-up frustration into action now, at a moment when India and the world are focusing on Delhi’s air pollution? Who can we reach quickly who has the influence and network to scale mobilisation and make the campaign, which had really just a few people on staff, credible and effective? The atmosphere was hazy outside but hopeful inside. 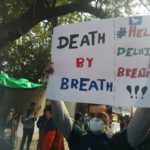 Help Delhi Breathe was underway. Help Delhi Breathe started with literal and strategic urgency. Opportunities demanded action before winter’s end so that people would get engaged and remain involved over time. The government also needed to see that people cared and could wield power. Help Delhi Breathe did a power mapping exercise to focus its outreach. The campaign identified several groups early on, including mothers, entrepreneurs and foreigners living in Delhi. Private schools were already taking action by independently tracking air quality data. This – schools monitoring air and advising families without government direction – was newsworthy on its own. Schools were sending the message to faculty and families that Delhi’s air wasn’t safe enough for children. 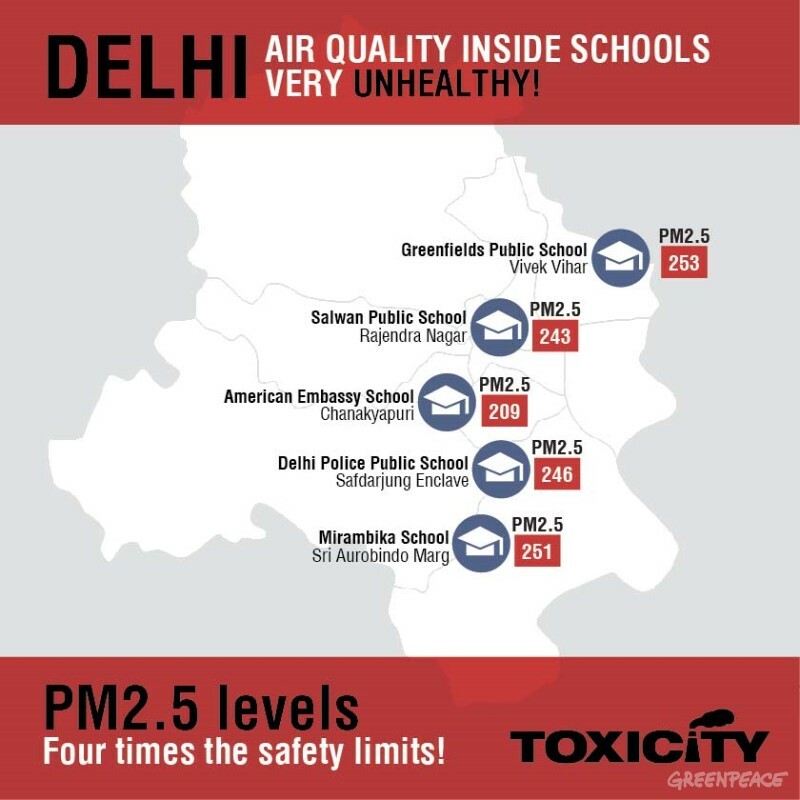 A February 2015 map of data from air quality monitors in Delhi schools shows parents, media and others the breadth of air quality problems and impact on schools. The campaign recognised that schools were the gateway to mothers. Help Delhi Breathe worked through schools and groups of mothers to build networks who could share messages (and Facebook posts), attend actions and mobilise friends. Small business owners and start-up leaders were also invited to help lead the campaign. Entrepreneurs who create and sustain jobs influence government policy. Small business leaders also see meeting people’s needs as an opportunity. 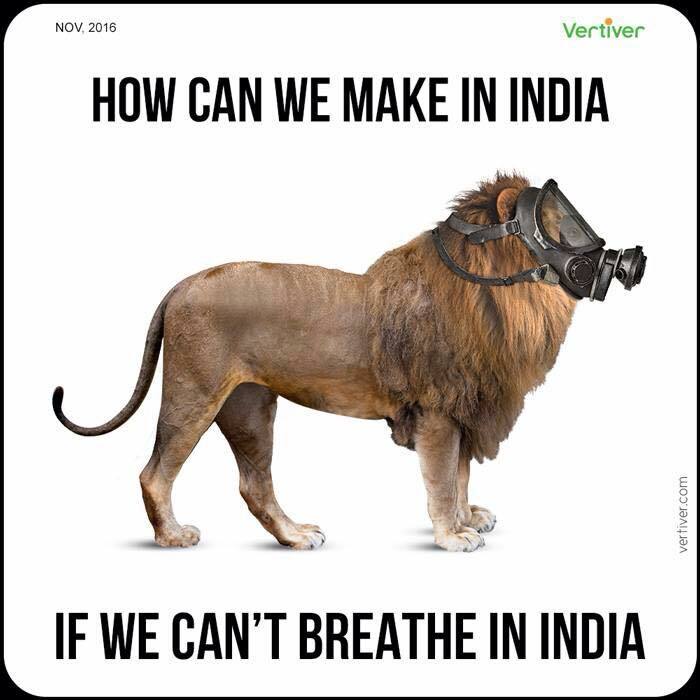 For example, Help Delhi Breathe collaborated with Jai Gupta, founder of Vogmask, a start-up that makes stylish breathing masks. Gupta helped organise a Clean Air Fair that brought together businesses and organisations to identify and promote air quality solutions. Another group, expatriates, played a surprising role. Foreigners have come to Delhi to start and staff new businesses. Most come from countries with stronger environmental laws, cleaner cars, more renewable energy and healthier air. Help Delhi Breathe provided expatriates a way to tell their story and voice their concerns. Gardiner Harris, a New York Times reporter then based in Delhi, wrote a widely read story in which he wondered if living in the city put his child’s health at risk. He moved his family to Washington, DC in mid-2015. Messages about air pollution were informed by input on tangible, everyday health and lifestyle impacts. When ads, images, print messaging and videos were created, people in Delhi’s middle class saw themselves, and their concerns, reflected. 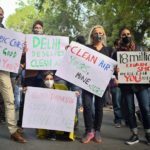 Help Delhi Breathe’s first winter produced a public-facing mobilisation campaign targeting people and groups in Delhi’s middle class. They tapped into anger and frustration with messages that said the situation is unacceptable and we will act. People attending a January, 2016, event calling for action on clean air in Delhi. Students carry signs at a 2017 action calling for clean air. 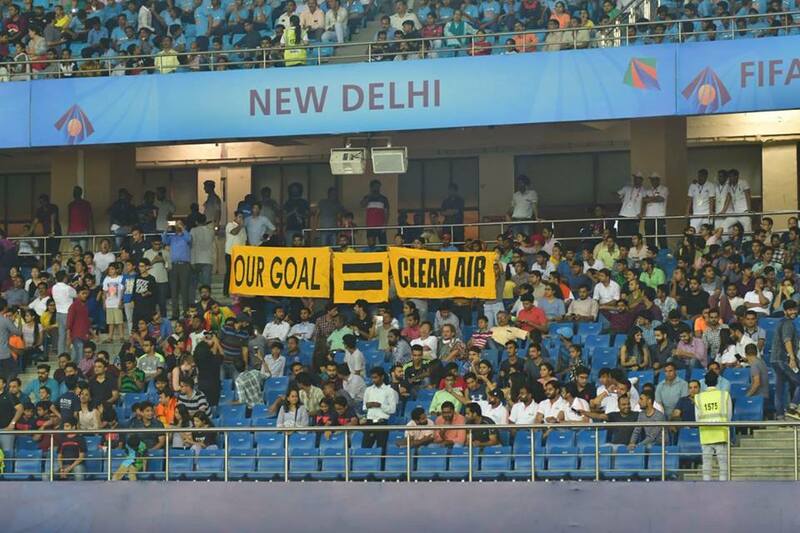 Signs demand action at a 2017 World Cup match in Delhi. 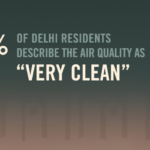 A graphic about the health risks of Delhi’s air created by Help Delhi Breathe. 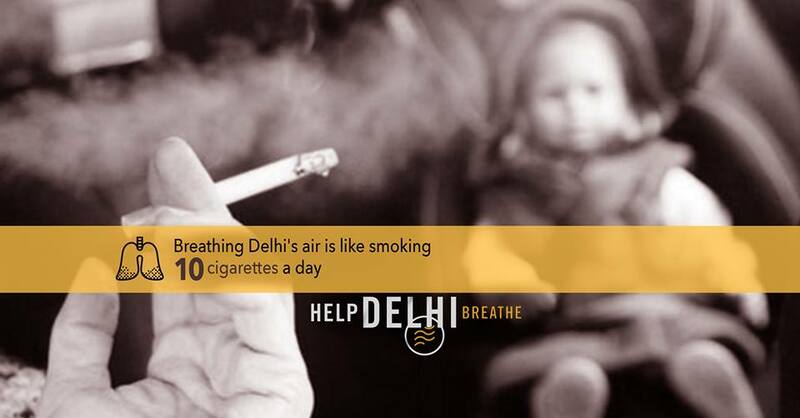 This graphic shared by Help Delhi Breathe conveys the message of entrepreneurs and business leaders. 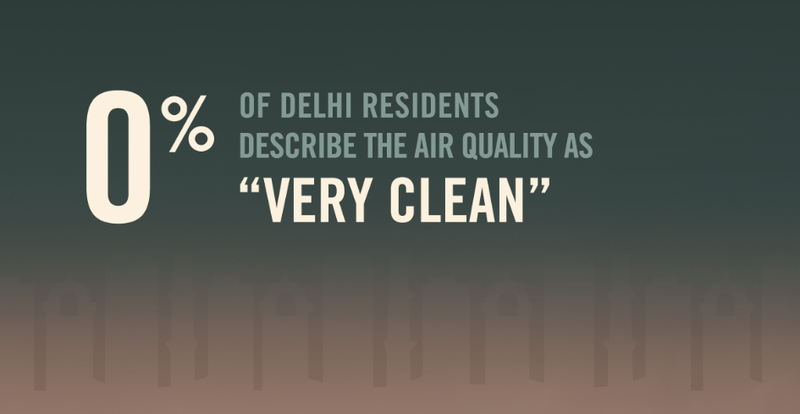 Survey shows that nobody in Delhi describes the air as very clean. A recent clean air campaign has focused on the impact of coal-powered thermal plants in India. Help Delhi Breathe also encouraged organisations in the network play to their strength. 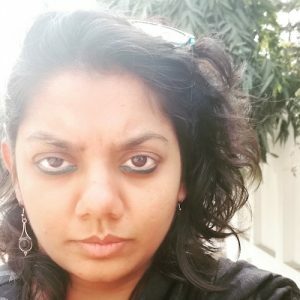 The staff of Purpose focused on brandless communications and messaging targeting middle class Delhiites. 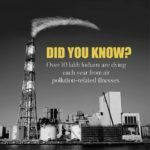 Meanwhile, Greenpeace India worked with its established record gathering air data and communicating with the media about the science and health impacts of pollution. 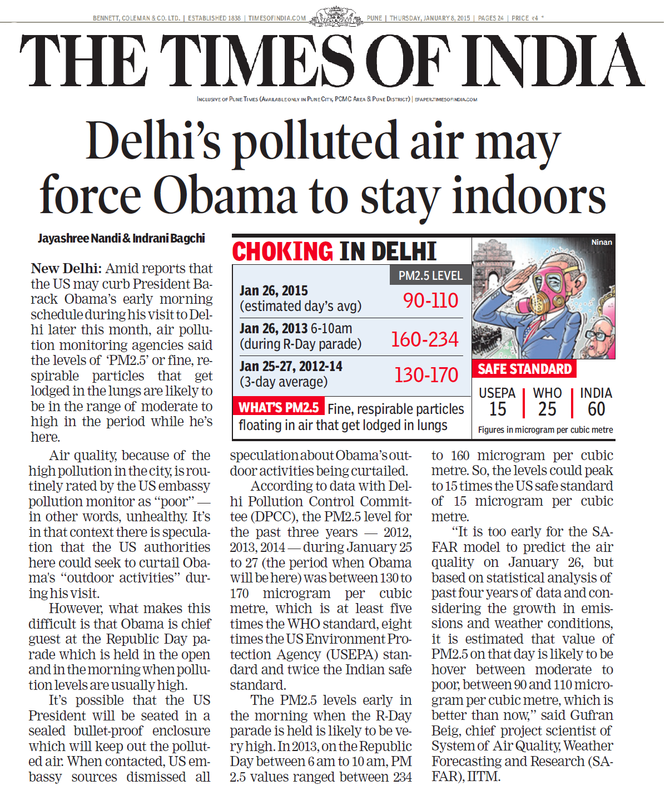 They constantly hit the media with data, at times comparing Delhi with Beijing’s pollution. Nobody in Delhi wants to be negatively compared to Beijing. Help Delhi Breathe doubled down on organising mothers, families and schools the following winter. 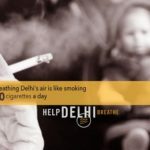 Mothers are now one of Help Delhi Breathe’s most engaged and active audiences. In 2016, the government shut down 1,800 schools because of poor air. It was a pivotal point in the campaign. The inconvenience to families caused by closing schools made more people notice how serious the issue was. Shutting down schools is an inconvenience for parents and also a clear message that the air is unsafe. Middle class families and their schools could afford to talk about air quality issues. Help Delhi Breathe understood that decision makers couldn’t ignore these communities and that forcing the government to act would impact people across Delhi’s broad economic and social spectrum. On January 17th, 2016, Delhi middle class Indians came to Jantar Mantar to protest inaction on air quality. As the political center of India, New Delhi and now Jantar Mantar, symbolise serious activism. A large, unexpected protest there can be a sign of things to come. Around noon, people walked in with their children and N95 masks to demand government actions such as a cleaner mass transit, support for bicyclists and pedestrians, halting agricultural burning across the region and more. 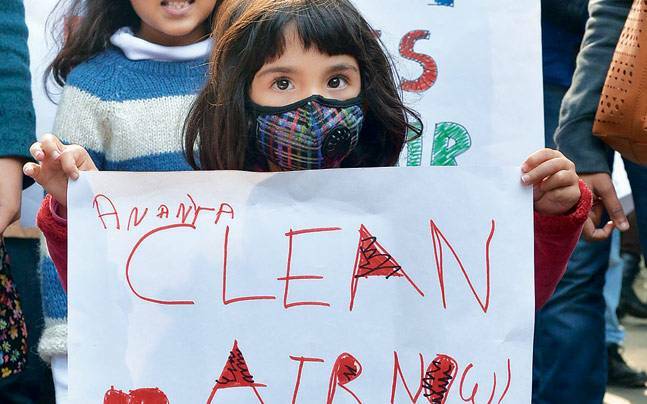 A child at a protest for clean air in Delhi’s Jantar Mantar in January 2016. The role of mothers in Delhi’s air pollution fight expanded when Help Delhi Breathe mobilised the Clean Air Coalition to use the #MyRightToBreathe hashtag. The online campaign has become a rallying point for mothers, students, activists and others involved in a wide range of clean air actions. With support from Help Delhi Breathe, mothers continue to play a key role in Delhi’s growing air quality activism. Moms and other parents played a key role in a recent demonstration in front of the Environment Ministry demanding implementation of thermal power plant standards as a way of reducing air pollution. Coal burning produces approximately 75% of India’s electricity. Help Delhi Breathe is now engaging new community leaders. They are testing a growing relationship with Haiyya, a grassroots organising group that trains and supports community leaders. Haiyya hasn’t been involved in air pollution issues in the past but has extensive neighborhood networks and is known for strong grassroots leadership training. Help Delhi Breathe knows that government policies are needed to change the transportation, waste and agricultural systems contributing to Delhi’s air pollution. But data, visible pollution and wide-scale health impacts hadn’t moved government to act. 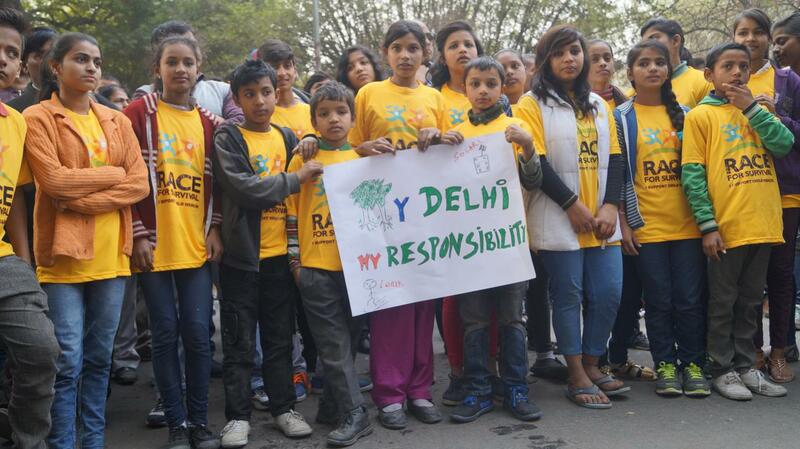 The campaign identified communities with the interest and capacity to lead action across Delhi. This led them to middle class groups including schools, mothers, entrepreneurs and expatriates. They recognised that many of these communities could influence politicians and government leaders. These frustrated citizens had seen enough empty promises and were primed to create change together if organised and empowered. 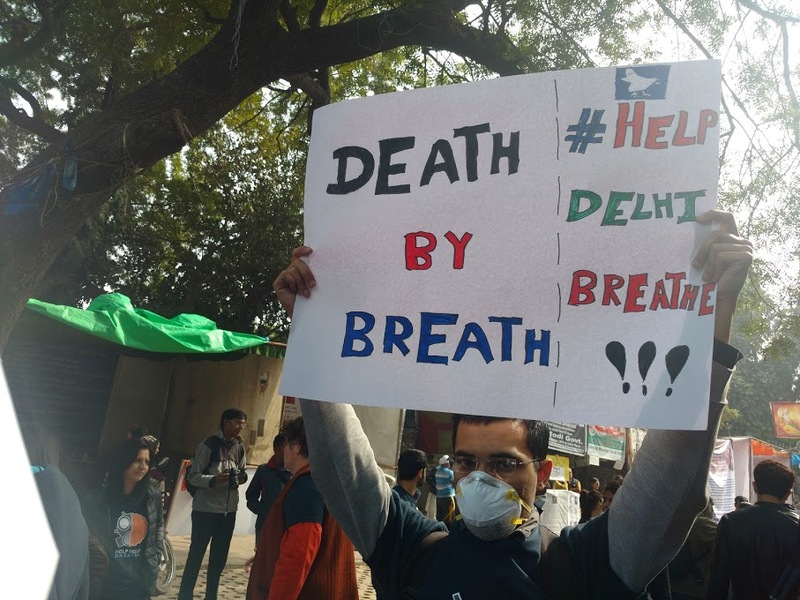 Help Delhi Breathe is, as much as anything, a vehicle for identifying people’s needs, listening to them, and creating messages, networks and platforms for action that give people power to meet those needs. Middle class people in Delhi are concerned about their children’s health. Help Delhi Breathe engaged mothers and schools, giving them ways to self-organise and take local actions ranging from attending protests calling for government to support renewable energy to installing solar and ending neighborhood waste burning. 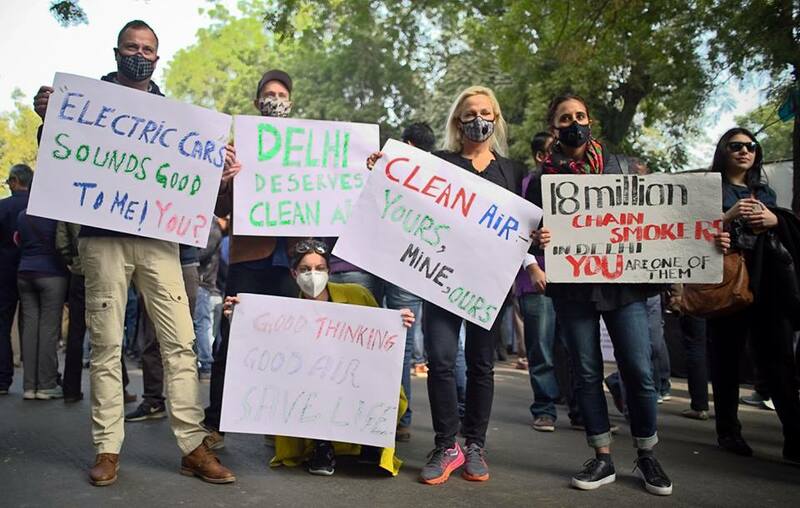 Entrepreneurs were invited to help organise Clean Air Fairs and other opportunities to both speak out and help Delhiites protect themselves from toxic air. Expatriates were given a voice. The campaign sought to establish credibility early on by tapping into the urgency of toxic air during the winter 2015, widespread reporting, and President Obama’s visit. Social media, videos and relentless organising of local communities gave people a way to express their concern. Help Delhi Breathe was able to act when the smog was at its peak, when the media was reporting on it everyday, when the social media feed was ‘choked’ literally by photos of smog days in Delhi. This was also when the campaign built networks and relationships that could push for policy change in the Spring and Summer months when air cleared up. These periods were a struggle for Help Delhi Breathe but organisers understood that the fury (and social media buzz) of winter couldn’t be sustained year round. Help Delhi Breathe has responded, in part, with new projects such as engaging Haiyya’s network to organise for residential solar power. Read the Purpose Labs case study of Help Delhi Breathe. Stay in touch with Help Delhi Breathe on Facebook, Twitter or Instagram.